The Company Savoretti Armando & C. snc with registered office in via ss. Regina Km.3.580 –62018 Potenza Picena (mc),Italy, VAT 00910840438 , (hereinafter Savoretti Armando & C. snc), owns Savoretti Armando & C. snc brand, which is marketed and distributed in Italy and in Europe through physical retailing and the website, owned by, Savoretti Armando & C. snc www.steeringwheelshop.com (hereinafter "Site"). The present general terms and conditions (hereinafter Terms and Conditions), regulate the online selling of Savoretti Armando & C. snc products (hereinafter Products),through the Site. These purchases are reserved to Site users, who reside in European Union's area and who intend to make use of the sale services of the Products (hereinafter Customers). The Customer is requested to acknowledge and read carefully the present Terms and Conditions before completing any purchase on the Site. Such information, in fact, are meant to be entirely read, understood and accepted by the Customer at the time of implementing a purchase order. The Customer shall therefore follow these Terms and Conditions and consider Savoretti Armando & C. snc as released by any different terms and conditions from those in force, not arranged in advance in writing form. 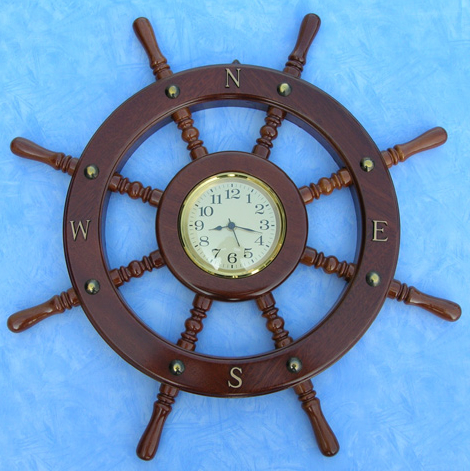 The available Products on the Site for the online purchase are nautical steering wheels. All Products are subject to the availability at the time of the order. Savoretti Armando & C. snc reserves the right to modify at any time the quantity and/or the type of products that may be purchased on the Site. The Customer will be informed if the requested Product is not available. All the prices on the Site are established in Euro and they include any VAT and applicable fees. The prices do not include shipping and delivery charges. Savoretti Armando & C. snc uses its best endeavor to ensure that all pricing information on the Site are accurate, but cannot guarantee the absolute absence of mistakes. In the event that a mistake in the price of a Product shall occur, Savoretti Armando & C. snc will allow the Customer the option to confirm the purchase of the Product at the correct price or to cancel the order. If Savoretti Armando & C. snc is unable to contact the customer the order will be considered as cancelled. Savoretti Armando & C. snc reserves the right to accomplish particular terms of sale or promotional offers on the Product(s) on the Site. The conditions applied to promotions shall be regulated from time to time by Savoretti Armando & C. snc through special communications to the Customers. For all those conditions not otherwise regulated, the present Terms and Conditions will be considered enforceable. The Customer shall be considered responsible for any action or irregular behavior against the laws in force or with the present Terms and Conditions committed by anyone using the personal account on his/her behalf. The Customer is required to promptly report to Savoretti Armando & C. snc about any theft or loss of the password, as well as any improper use of the account or of the password committed by a third party. Savoretti Armando & C. snc informs all Customers that the Site contains links to other websites, that might have no connection with the present Site; furthermore Savoretti Armando & C. snc specifies that the present Terms and Conditions are exclusively in force for the Site and not for other websites that the Customer might visit through the links managed by other owners ;Savoretti Armando & C. snc does not carry out any check or monitoring. Savoretti Armando & C. snc declines any responsibility in case of mistakes, contents, cookies, publications displaying immoral or illegal contents, advertising, banners of files which are not in compliance with laws in force and to the Privacy Protection on the side of websites out of Savoretti Armando & C. snc owner's management. Savoretti Armando & C.snc with registered address in SS.Regina Km.3.580 –62018 Potenza Picena (mc) Italy, is responsible for data processing. The personal data provided by the Customer may be transferred to a third party exclusively for reasons related to the fulfillment of required services and institutional activities or operations connected with the activity carried out by Savoretti Armando & C. snc. f) for functional aims connected with Savoretti Armando & C. snc’s activities, for which the Customer has the right to accept or refuse the data processing; these purposes include, for example: forwarding of advertising material, news, promotional offers, data for statistic purposes, data processing to create Customers' profile. The Customer's personal data must be required and collected and have to be provided compulsory for the purposes described in a), b), c), d) and e). In these cases the denial of acceptance will prevent the conclusion of the purchase agreement, thus, the orders or services requests will be not executed by Savoretti Armando & C. snc. Failing the consent of optional data processing for the purposes described in f) this will not involve any prejudicial consequence. In order to facilitate the identification of the compulsory nature of the required data, the relative field will be marked by an asterisk (*). Companies related to Savoretti Armando & C. snc for market analyzing, marketing activities and communication. The treatment of data processing by these subjects is directed to the fulfillment of instructions received from the Customers and/or to the filing on data processing supports. The data may be communicated to all the subjects to whom the communication is due according to law obligations. e) the subjects or the subject categories to whom the data may be communicated or who are allowed to be informed as designed representatives inside the state's territory, as in charge of or delegate. The details and the price of the Product are detailed in the single page of each Product listed on the Site. The orders can be executed, subject to registration and creation of a Customer's personal account, as described in previous paragraphs, following patterns and instructions specified in the Site. The purchase agreement entered by Savoretti Armando & C. snc and the Customer shall be considered completed and duly entered by the Parties at the time in which the order is duly submitted by the Customer - in accordance with the purchase procedure indicated on the Site and after that Savoretti Armando & C. snc has received the authorization from the credit card issuer that the payment is accepted. The order submitted by the Customer shall be binding for Savoretti Armando & C. snc only if the entire purchase procedure has been duly and correctly completed without any mistake notification by the Site. Savoretti Armando & C. snc is not responsible for any eventual mistakes caused by the technical malfunctioning of the Customer's internet connection service. By submitting the order to Savoretti Armando & C. snc the Customer acknowledges and states that he/she has reviewed and accepted all the indications provided in the purchasing procedure and he/she entirely accepts the present Terms and Conditions. The online order form will be stored in the Sites database for the time necessary for the fulfillment of the order. Savoretti Armando & C. snc will send to the Customer an e-mail confirming the receipt of the order placed by the Customer, including a summary of the Product(s) ordered, the details of the products purchased; the time and date of the purchase; the information about customer care and about the commercial warranties; the terms for the withdrawal from the present purchase agreement; the payment condition chosen by the Customer, the detailed price of the Product(s), the delivery charges. The Customer shall immediately verify the content of the e-mail and shall notify immediately Savoretti Armando & C. snc of any error mistake or omission. The Customer may pay for the Products and the shipping expenses by credit card. Savoretti Armando & C. snc accepts payment by credit card or Bank Transfer. In order to prevent internet frauds, the payment effected through the Site will be managed online by the assigned bank through the instruments QuiPago offered by KeyClient. This company is responsible for the preservation and the for the automatically processing the information related to each order "including financial information" within a protected environment. All financial information, such as credit card number, expiring date etc. are directly managed by KeyClient, which guarantees for the security of online transactions. Savoretti Armando & C. snc never get information with the essential data of credit cards and it isn't therefore able to record nor keep them in any way. The transaction will be charged to the Customer's credit card only once the credit card data has been verified; and only after that Savoretti Armando & C. snc has received the debiting authorization from the credit card issuer and Product availability has been verified by Savoretti Armando & C. snc. The Customer's credit card will be charged only once the order is ready to be shipped. The card will not be charged at the time of the submitting of the order. In case of payment through Bank Transfer, it’s requested to provide for the payment within 3 days from the reception date of your order. In the bank transfer, it has to be specified the reference number of your order given at the moment of the purchase, the name and surname of the customer. The shipment of the product will be executed after the payment’s credit (credits will be credited after 3/7 working days on our account). For the delivery the Customer may choose his/her residence, domicile, place of work or the private address of any natural person EU residing or domiciled according to Customer's choice. For security reasons the Product(s) purchased on the Site cannot be sent to P.O. Boxes or BFPO addresses and these orders will not be processed. For each order completed on Site, Savoretti Armando & C. snc will issue an invoice for the shipped Products, together with the Product in accordance with the prevision of the D.P.R. 445/2000 and D.L. 52/2004. For the invoice issuing Savoretti Armando & C. snc will refer to the data provided by the Customer. Once the invoice has been issued no modification of the same will be possible. The shipping and delivery expenses will be charged to the Customer and are clearly indicated in the online form. The shipping and delivery charges may vary depending on location and on the type of shipment requested. All the Products will be shipped via DHL or others (hereinafter Courier) which will be delivered in 5 days following the settlement of the order. (ii) that the packaging is not damaged, or wet or in any case tampered with the packaging materials, too. Any damage in the packaging and or in the Product(s) or any discrepancy between the number of the boxes actually delivered and the number of the boxes indicated on the shipping document, shall be immediately notified by indicating it in writing on the Courier's delivery documents. Once the Customer has signed the Currier's shipping document, the Customer may not oppose objection on the external characteristic of the delivered goods. In the event that, due to sudden and temporary unavailability of the Products, Savoretti Armando & C. snc isn't able to deliver the goods, Savoretti Armando & C. snc shall promptly inform the Customer, and in any way within thirty (30) days via e-mail. The amount already paid by the Customer shall be credited as quickly as possible and in any case within thirty (30) days from the settlement of the purchase order. Once the Product(s) have been sent, Savoretti Armando & C. snc will send a confirmation e-mail to the Customer. In order to guarantee the security of the delivery of the Products Savoretti Armando & C. snc will keep the tracking number of each delivery. Savoretti Armando & C. snc wishes to offer the complete satisfaction of the Customer. The refunds will be issued in the same form used for payment. The purchased goods may be returned within maximum 15 (fifteen) days from the delivery date. The Products purchased online cannot be refunded nor returned in any retail stores. The delivery costs are not refundable. All return delivery charges of the Products shall be charged to the Customer: each and any cost charged to the Customer for the return is not refundable. Savoretti Armando & C. snc reserves the right to refuse the return of those Products that do meet the requirements as per above paragraph. Each delivery will contain simply instructions to follow for the return of the Products. Savoretti Armando & C. snc undertakes to promptly refund the Customer within 30 (thirty) days from the written order cancellation request and receipt of the goods. Once the refund has been completed Savoretti Armando & C. snc will send a confirmation e-mail. Savoretti Armando & C. snc recommends to use an insured courier for the return of the Product(s) in order to allow the tracking of the shipment. Savoretti Armando & C. snc will not be responsible for the refund or the compensation of those Products which have been lost, stolen or damaged. According to the previsions of article 64 of the D. lgs n. 206/2005, the Customer has the right to withdraw from the agreement without any penalty and without specifying the reason within the term of 15 (fifteen) working days from the receipt of the Products, except the provisions of following paragraphs. the order number issued at the time of the purchase. This notice may be sent within the above stated period of 15 (fifteen) working days also via telegram, telex, fax, too with the only condition that the notice have to be sent via registered mail with advice note within the following 48 (forty-eight) hours. within 24 (twenty-four) hours from the submission. Savoretti Armando & C. snc will use its best endeavors to satisfy the Customer. Moreover, once the product has been sent, the order may no longer be modified nor deleted until the Products have been duly returned to Savoretti Armando & C. snc. To this extent please refer to the prevision of the above paragraph. Savoretti Armando & C. snc uses its best endeavors in order to keep the information on the Site constantly updated. Nevertheless it is not possible to guarantee the complete absence of mistakes on the Site. The Site might carry typo's, errors, inaccuracies and omissions some of which may refer to the price of the Product, to the product availability and/or to the details of the Products. Savoretti Armando & C. snc reserves the right to amend the errors and inaccuracies also after that the order has been submitted and furthermore reserves the right to amend or modify the information on the Site at any time without prior communication. Savoretti Armando & C. snc guarantees the authenticity of all the Products purchased on the Site. The Products marked Savoretti Armando & C. snc are made with the best materials and produced by the best craftsmen. All the Products are made in Italy. All the intellectual property rights such as trademarks, service trademarks, marks and copyrights are exclusive property of Savoretti Armando & C. snc. No page or other content of the Site may be reproduced without the prior written approval of Savoretti Armando & C. snc. The present Terms and Conditions are regulated by the Italian law. Savoretti Armando & C. snc reserves the right to modify the present Terms and Conditions of sale at any time. Any changes, modifications, removals or addition will go into force just after their submitted communication means of notes issued on the Site. Once the communication is given any access and use of Savoretti Armando & C. snc’s services by the Customer is meant to be considered as a complete acceptance of the changes that have occurred. The Customer accepts the non exclusive jurisdiction of the Italian courts. For any dispute arising from or in connection to the navigation or the use of the Site the competent court shall be the court of residence or domicile of the customer.